Franklin Barbecue: A Meat-Smoking Manifesto is an excellent meat-smoking resource! Aaron Franklin, an award-winning pitmaster, shares his knowledge and secrets of success in this meat-smoking manifesto. His love and enthusiasm for Central Texas barbecue is evident and he shares his passion in these pages. Franklin Barbecue: A Meat-Smoking Manifesto is a book my husband and I both use and enjoy. From building or modifying a smoker to serving and eating, this book is brimming with detailed information and includes step-by-step instructions, beautiful pictures, and mouth-watering recipes. This meat-smoking manifesto is exceptional, and we look forward to using it again and again! Whether you are a beginner looking for direction or a seasoned pitmaster looking to perfect your method, Franklin Barbecue: A Meat-Smoking Manifesto is the book for you! 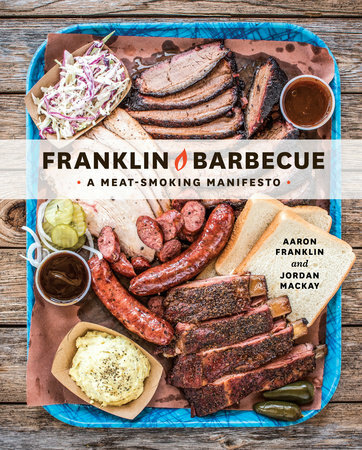 Click here for more information about Franklin Barbecue: A Meat-Smoking Manifesto and to read an excerpt. Great review, Britney! My mouth is watering!